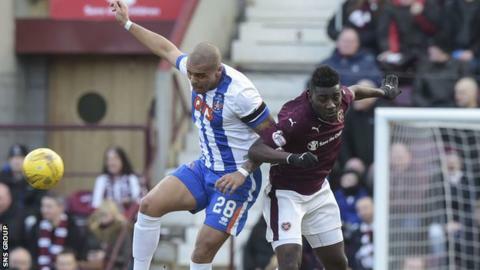 Kilmarnock's Josh Magennis has made a police complaint, alleging he was racially abused from a section of the Hearts support during Saturday's match. The incident originated in the Wheatfield stand at Tynecastle, where Killie lost 1-0. Both Scottish Premiership clubs told BBC Scotland they are aware of a complaint. And a police spokesman said: "We can confirm we have received a report of racial abuse. Enquiries are ongoing." It is not yet clear if the episode involves one fan or more. Northern Ireland forward Magennis, 25, is in his second season at Kilmarnock and has scored 10 goals this term. Hearts said in a statement they would "fully support any police investigation into reports of abuse such as the one which has been reported".